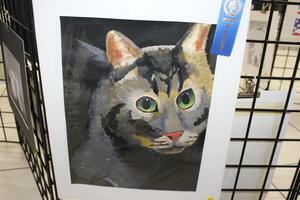 First-place winners will see there work advance to the regional round of competition. The 50th Burlington Women’s Club county-wide student art competition was recently held at Holly Hill Mall and TBS students claimed eight awards. The artwork will be displayed through Jan. 27. For the 10th consecutive year, TBS Middle School art students swept all painting awards! In graphics, William Whitley received Honorable Mention recognition. All first-place winners advance to the regional competition in Greensboro. First-place winners there will then go move on to the state competition held in Winston-Salem in February.